Digital Commons provides a journal publishing platform that combines submission management, editorial, and peer-review tools in a flexible, hosted solution. For assistance with configuring a journal, managing submissions, peer review, or publication, contact bepress Consulting Services at dc-support@bepress.com or phone us weekdays at 510-665-1200, opt. 2, 8:30am-5:30pm Pacific time. Below are instructions for performing common editorial and publishing tasks in a Digital Commons journal. As workflows differ, not every journal will follow all of the steps included here. Editors with permissions enabled for a journal can access editor tools from either their My Account page or the Administrator Toolbar. Depending on your particular editorial permissions, you may or may not have access to all of the editor tools. The following appear on your My Account page and, once you access the tools, they appear as tabs along the top of the screen. You may also see a Dashboard tab, if you have access to reports. Manage Submissions: Access to submissions already in the system. Depending on specific privileges, this includes handling peer review, editorial decisions, revisions, and publishing. Upload: Allows you to upload submissions to your journal. This can be a manuscript of your own or a manuscript you are submitting on behalf of someone else. Note: new versions of existing manuscripts are uploaded by revising in Manage Submissions, not via Upload. Configuration: Various settings establishing the journal’s workflow, policies, editorial access permissions, and tools to create new volumes and issues. Mailings: For accessing the journal mailing list features. When authors or reviewers log in to their My Account page, they do not see the editor tools. They only see their submitted manuscripts and assignments. Repository administrators can also access editor tools for journals via the site-level configurations. However, they will not see the above options on the My Account page unless they are also specifically added as editors to individual journals. Editors may also access tools from the front end of the journal. Once logged in, an editor will see an Administrator Toolbar across the top of screen when browsing the journal. Navigation options display for Configuration, Dashboard, and Manage Submissions. Additionally, at the article level, an Edit Submission option displays for going straight to an article’s Submission Details page. An author submits a manuscript to the journal. If the journal has multiple editors, the managing editor may assign submitted manuscripts to specific editors. The editor selects potential reviewers. The editor sends requests to prospective reviewers. Reviewers respond to review requests until enough agree to review the submitted manuscript. Committed reviewers submit their referee reports. The editor reads the reports and registers an editorial decision (accept, accept with minor revisions, major revisions required, or reject). Once the article is accepted, the author submits a final version which he/she has modified for publication according to the journal’s style guidelines. The editor verifies the look and accuracy of the final version and requests the author’s approval for publication (optional). The editor assigns the approved manuscript to open issue. The editor publishes an entire issue or a single manuscript. The sections below outline how each of the above phases is handled within the Digital Commons Journals system. The author emails the manuscript to the editor, who then uploads the manuscript on behalf of the author. The latter option is often used by editors when building the journal’s initial issues. Both scenarios for submitting manuscripts are outlined below. Regardless of the method used, submitted manuscripts are stored in the Not Yet Published queue on the Manage Submissions screen. Submissions can be allowed or disallowed depending on the editors’ preferences. Use the Hide link to submit form setting in the journal configurations if you wish to suppress the author submission link in the journal’s sidebar. Submission Instructions appear first. Information required for submission and other important guidelines are outlined. Click Continue. The Submission Agreement appears next. Authors must click Accept to continue. Authors confirm their contact information. Click Continue. Enter co-author’s email address, and click Add author. If you do not have an email address or do not want emails sent to the author regarding the status of the manuscript, click Add author and leave the email address field blank. Note: Not all journals permit authors to be added without email addresses. This is a configurable feature. Next, enter the co-author’s name and affiliation. Click Add to list of authors. Repeat these steps for each co-author. A drop-down menu next to each author’s name allows submitters to re-order the authors. Delete authors by clicking the Delete button next to the name. To edit an author’s name or affiliation, click the Edit button next to the name. If names and affiliations are entered exactly as they should appear on the published manuscript, the author clicks Continue. The author will complete the submission form and then press Submit. The submission form fields will vary by publication. Fields can be added or removed at the editors’ request. Please contact Consulting Services for more information. The author views an on-screen message, confirming that the submission is complete. The author can preview the submission, make corrections, and upload associated files. Supplemental files will display by default upon publication. To manage the public display of these files, use the Supplemental Content link for the submission. When finished, click Log out. The submission is now complete. As soon as the manuscript is submitted, an email notifies the editor(s), and the editorial process begins. 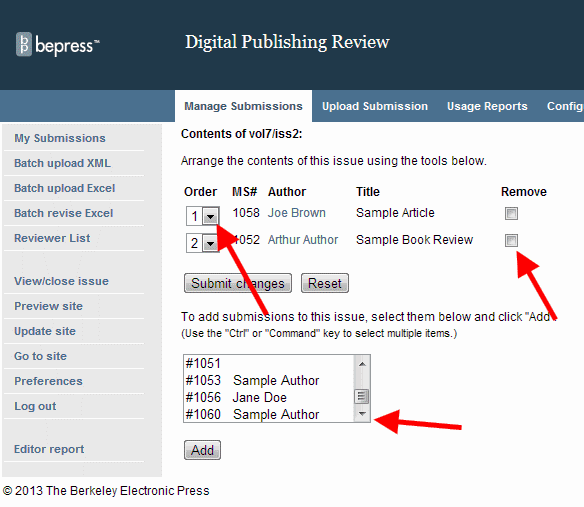 For more about the author’s workflow, see Author Submission Steps in Digital Commons. In the Editor Tools section, click Upload. The Submission Instructions and Submission Agreement will be skipped. Enter the author information and complete the submission form as described in the previous scenario. Authors will receive email notifications for automatic PDF conversions of any manuscripts uploaded to the journal on their behalf or when an editor revises the manuscript. Consulting Services can disable the automatic notifications sent to authors upon request. Whether manuscripts are submitted by authors or by the editors on behalf of authors, all submitted manuscripts appear in the “Not yet published” list on the Manage Submissions page until they are published, withdrawn, or rejected. Journal editors will be notified via email when a manuscript is submitted and added to the “Not yet published” list. Navigate to the My Account page or use the Administrator Toolbar. By default, the resulting screen displays the list of “Not yet published” manuscripts. The journal’s manuscripts can be filtered using the search features on the submission management screen. The columns in the table display the following information about each manuscript. Using the Preferences link in the left-hand sidebar, editors can change the information that displays on this page. To access information about published, rejected, or withdrawn manuscripts, navigate to the Manage Submissions page from the My Account page or the journal’s Administrator Toolbar. By default, the Manage Submissions screen displays the list of “Not yet published” manuscripts. The journal’s manuscripts can be filtered using the search features on the submission management screen. Using the drop-down State menu (and other search fields) filter the list to find the desired manuscript. To work with a manuscript, click on its title in the Manage Submissions list to view its Submission Details page. This page displays details such as the last event to occur, the cover letter, and current version of the abstract and full-text. All of the commands for working with the manuscript are available in the left-hand sidebar of the manuscript’s Submission Details page. Return to the main Submission Details view at any time by clicking “Submission details” in the left-hand sidebar. Click Preview Submission to see how a published version of the manuscript information page will appear on the journal website. Click History to view major actions that have been taken for the manuscript by author, reviewer, editor or Consulting Services. Upon submission, manuscripts are automatically converted into PDF files. An email notification is sent to the journal editors, and if a specific turnaround time has been set for the journal, the clock for the editorial decision process begins. The Submission Details page will now display a link to the downloadable PDF, along with the file size and conversion date. By default, a cover page will be generated when the manuscript is converted into a PDF. To ensure author names are not revealed, check converted documents for any identifying information the submitter may have included before assigning the submission to reviewers. Use this option if the editorial staff wishes to assign editors to specific manuscripts. From the Manage Submissions screen, click on the title of the manuscript in the pending submissions list. Click Assign Editor in the left-hand sidebar of the resulting Submission Details page. A list of editor names will be displayed. Click the button next to the name of the editor who is to be responsible for this manuscript. To include a comment with the assignment, enter it into the text box provided. This comment will only be visible to editors. Click Assign. An email message will be sent to the newly assigned editor with notice of the assignment. Any comments will also be included in this email. The manuscript will now list “Editor assigned” as the Last Event, and the manuscript will carry the red Waiting for Editor dot in that editor’s Manage Submissions list. When a manuscript is assigned to an editor, all correspondence from the manuscript’s author(s) and reviewers will be directed to the assigned editor. If you need to assign many submissions at once, ask Consulting Services about enabling the mass assign option. Note: While the name of the assigned editor is displayed in email messages to author(s) and reviewers, our system will anonymize personal email addresses. 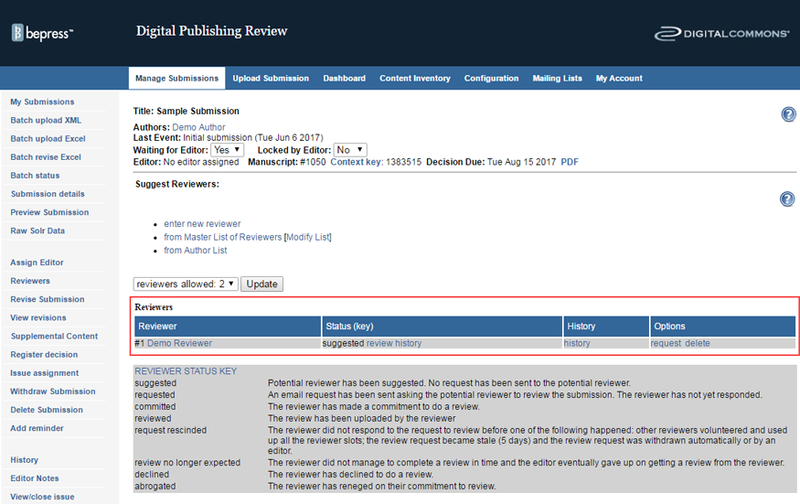 To begin the review process for a manuscript, navigate to its Submission Details page and click Reviewers in the left-hand sidebar. From the Reviewers screen editors first compile a list of suggested reviewers for the manuscript. Suggested reviewers do not receive a notification unless the editor sends a formal request for a review. Enter new reviewer: Enter the full name and email address of the person. The affiliation field is optional. From Master List of Reviewers: These are all the people who have reviewed for the journal in the past, as well as any new reviewers designated to appear on this list. This list can be searched and sorted to locate a particular reviewer. Tip: If you have a list of potential reviewers you’d like to include in the Master List of Reviewers, Consulting Services can provide you with a batch reviewer spreadsheet to fill out and return to us. From Author List: Displays all authors who have submitted to the journal. By default, journal authors are added to the master list of reviewers. If editors would prefer to not include authors in this list, please contact Consulting Services. and whether the reviewer is an author in the journal. Click the Show All button to view the full reviewer list. While journal editors can suggest and request an unlimited number of reviewers per manuscript, a maximum number of required reviewers can also be set. This ensures that no more than the necessary number of reviewers can accept review requests, and keeps the status messages sent to editors accurate with regard to the number of additional reviews required. If more reviewers are requested than are required, reviewers who have not responded to the request will be notified automatically that the journal no longer requires their review when the required number of reviewers have committed. Editors can modify the number of required reviewers for all manuscripts or for individual manuscripts. To adjust the number of desired reviewers for all manuscripts, navigate to the Configuration page for the journal and enter the maximum number of required reviews. To adjust the number of desired reviewers for a specific manuscript, navigate to the submission details page and click on Reviewers. In the drop-down menu above the Reviewers table, select the number of required reviewers and click Update. After building a list of suggested reviewers, editors can request reviews from some or all of them. Navigate to the manuscript’s Reviewers page. Click the request link next to the reviewer’s name. From the review request page, editors send an email message to requested reviewers. 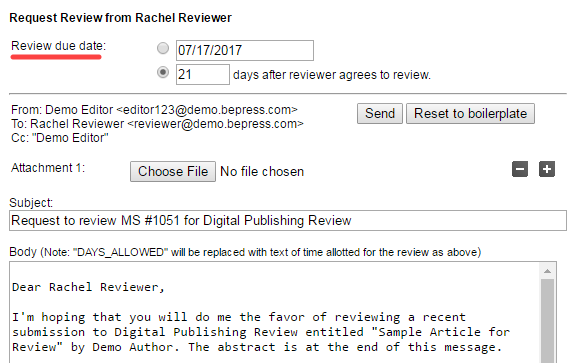 By default, the email includes how long the reviewer has to respond to the request, the review due date, and a link to a page where the reviewer either accepts or declines to review. The text of the email can be modified. The options available for the review. The Options column will change depending on reviewers’ individual status. As a reviewer changes state—e.g., from “requested” to “committed”—certain commands will disappear and new ones will appear. Committed reviewers will receive automatic reminders at designated intervals while their reviews are still outstanding. The frequency of these reminders is configurable. Once completed, reviews will appear in a Submitted Reviews table on the Reviewers page. To view a reviewer’s recommended decision and report, click the view link next to a reviewer’s name in the table. Once the reviewer has committed to the review, she/he will arrive at the report upload form where she/he uploads the full-text report, recommends an editorial decision (e.g., “Major revisions required”), uploads a cover letter only the editor can see, and—this is an optional, configurable feature—uploads attachments intended for the author(s). To see a full description of the reviewer’s perspective during peer review, see Peer Review Tools. Report: Reviews may be submitted as PDF files, MS Word/RTF documents, or plain text pasted into the provided text box. If an MS Word/RTF file is uploaded, it will be converted to a PDF. This automatic conversion removes the reviewer’s identity from the document Properties of any file. It is up to the reviewer and assigned editor to verify that the reviewer’s identity is not included within the report. The assigned editor can hide the report if the reviewer mistakenly includes identifying information. Cover Letter (optional): Only visible to editors. Never shared with authors. Attachments (optional): PDF, MS Word/RTF are recommended. However, any file type can be attached. The reviewer and assigned editor should verify that the reviewer’s identity is not revealed in any attachment, as they will become available to the author(s) once an editorial decision is registered. Once a referee report is submitted, the manuscript’s Last Event will change to Review completed. Assigned editors receive automatic email notification when referee reports are uploaded. Editors receive automatic email notification if additional reviewers are needed for a manuscript. Just as editors can upload submissions on behalf of authors, editors always have the option of uploading reports on behalf of committed reviewers. If a reviewer emails his/her report to the editor, it can be uploaded to the system by using the upload report for reviewer feature next to the reviewer’s name on the manuscript’s Reviewers page. If the report is shown to authors after an editorial decision is registered, a report uploaded by an editor on a reviewer’s behalf will appear to authors as if the reviewer submitted it himself/herself. The system will notify editors and reviewers when a review is late or if a potential reviewer hasn’t responded to a request. Suggest a new reviewer: Choose a new reviewer from the Master List of Reviewers or author list. Remind reviewer: If the due date is approaching or has passed, use this option to send a reminder. Revise report due date: Choose revise due date to specify a new report deadline. Give up on a reviewer: Choose give up to indicate that a review is no longer expected from the reviewer. The system will notify the reviewer and cease reminding him/her of the overdue report. By default, referee reports are made available to authors once an editorial decision is made. If this setting is turned off, referee reports will not be shared with authors. Reports can be hidden from authors by choosing the Hide option next to the report on the Reviewers page. Hidden reviews will not be displayed to the author even if a decision is registered. The Hide option overrides the default setting of sharing reports after a decision is registered. Once editors have read the referee reports, it is time to register an editorial decision. Navigate to the Submission Details page and click on Register Decision in the left-hand sidebar. Accept Submission: Article is accepted for publication as is (i.e., no revisions necessary). Accept Submission with minor revisions: Article is accepted for publication assuming the author makes minor revisions as requested by the editor. The requested revisions may be included either in the body of the acceptance message or in an attached file (such as a tracked-changes version of the native MS Word file). Minor revisions typically include formatting changes. Major Revisions required for acceptance: Article is not suitable for publication without major content revisions. The author is invited to make changes and submit a revision. Select this option if revisions may require another round of peer review. Reject Submission: Article is not worthy of publication in the journal. Rejected manuscripts are immediately removed from the “Not yet published” list on the Manage Submissions page. (Rejected manuscripts can always be found by filtering the Manage Submissions page to display manuscripts in the “Rejected” state.) If you need to reject many submissions at once, please contact Consulting Services. For each decision selected, a default version of the draft decision letter will appear. Decision emails can be sent as is or modified before sending. Upon acceptance, authors receive both the decision letter and a second, follow-up email linking to the journal’s formatting guidelines. Modify the decision letter. Be sure to include any important information regarding referee reports and/or suggested or required revisions. Reviewer(s) can be copied on this letter. Please be mindful of whether or not to share the author’s identity with the reviewer(s) in the body of the letter. If identities should not be shared, references to authors’ names in the body of the decision letters should be omitted or copies of decision letters should be withheld from reviewers. Note: for double-blind journals, the salutation is not sent to reviewers; authors’ names can safely be included in the salutation. If additional files will be included in the decision email, click Choose File to locate and select the desired file. Click the plus (+) button to upload multiple attachments. Click the corresponding minus (-) button to delete an attachment. It is not necessary to attach the full-text manuscript or referee reports to the decision letter—these will be available to the author through their account. Note: Do not delete the ATTACHMENT LINK placeholder in the text of the email when modifying the message. This text ensures that files are attached when the email is sent. Click Register Decision to send the letter and formally register the editorial decision. Once a decision is registered, any referee reports will be made available to the authors (unless they have been marked as hidden on the Reviewers page). This option can be disabled by contacting dc-support@bepress.com. To access a previously-sent decision letter, navigate to the Submission Details page, and choose the Decision Letters link in the left-hand sidebar. All decision letters and attachments for that particular manuscript are archived on this page. Edits to manuscripts may be requested and completed at any time during the publication process. After a submission has been accepted or accepted with minor revisions, editors can request additional revisions using the Request minor revisions command in the left-hand sidebar of the Submission Details page. During the revision stage, authors may submit revisions to their manuscripts unless the manuscript is locked for editing. Once published, editors can still submit and publish revisions. Requests for minor revision will be archived on the Decision Letters page. Authors may revise submissions before publication by visiting their My Account page, clicking on the title of the submission, and clicking Revise Submission on the resulting details page. There is a free-text field at the bottom of the revision form where authors are encouraged to notify the editor of the reason for the revision. If an author submits a new cover letter with a revision, it will display beside the heading Most recent cover letter on the Submission Details page. Previous cover letters are archived and will always be available on the View Revisions page. Prior to publication, manuscripts can be locked by editors to prevent unauthorized revisions by authors. To lock a manuscript, select Yes from the Locked by Editor drop-down option on the Submission Details page. After locking a submission, authors will be able to view their manuscripts in process but will not be able to edit them. Editors can revise locked unpublished manuscripts. Editors can revise any part of a submission before and after publication. To make changes to a submission, click the Revise Submission link in the left-hand sidebar of Submission Details pages. Make the desired additions or changes on the revision form, and click Submit changes when finished. Editors may note the Reason for Update before submitting the changes. Double blind journals: Which manuscript version should be selected for review and publication? When manuscripts are not locked, authors can submit revisions prior to publication. Multiple versions of the manuscript may be available, but only the editor-selected version is under consideration during the review process. This ensures that all parties work with the current version of the manuscript. The assigned editor will be notified via email when a manuscript is revised. The editor can then log in to the system, navigate to the Submission Details page, open the latest version, and decide if he/she wants to select this manuscript as the most recent version. If the author submits a revision, it is up to the assigned editor to decide whether or not the upload becomes the current version of the manuscript slated for publication. The editor finalizes this decision on the manuscript’s View Revisions page. If the editor submits the revision on the author’s behalf, that version is selected as the current version under consideration (this is also the version that will display on the Preview Submission page). Click View Revisions in the left-hand sidebar. The Revision History table will display all versions of the full-text and cover letter documents submitted to date, as well as their converted PDF counterparts. If there are multiple versions, view the most recent submission by selecting the associated view radio button. To select a version as the one to use for peer-review and publication purposes, select the radio button next to the desired version and click Save Changes. Digital Commons Journals provide a feature that allows the editor to annotate a manuscript for his/her own benefit: Editor Notes. These notes will only be seen by editors and administrators of the publication who visit this page; they will not be made visible if the article is published, nor will authors or reviewers ever have access to them. Only the most recent note appears on the details page; to view all past notes, click on Editor Notes. Navigate to the Submission Details page. Click Editor Notes in the left-hand sidebar. All previous editorial comments for the manuscript are listed here. Enter comments in the form and click Add note. Click Reset if you want to clear all text from your current comment and start over. When editors register a decision of ‘major revisions’ for a manuscript, it can be sent out for a second round of peer review or re-review. Typically, in the case of re-review, the original reviewers are called upon. However, editors may select new reviewers from the Master List of Reviewers. As soon as a reviewer submits a report, a new request rereview option will appear beside his/her name on the Reviewers page. Navigate to the Submission Details page and click on Reviewers in the left-hand sidebar. Click the request rereview link beside the reviewers you want to re-review the manuscript. Modify the re-review request letter if desired and click Send. The re-review request letter informs the reviewer that the editor assumes he/she will complete the review unless the reviewer replies otherwise. After a re-review request is sent, the reviewer’s status on the Reviewers page will change to “committed,” and list the due date of the re-review report. Completed re-review reports will appear in the same Submitted Reviews table on the Reviewers page that houses the manuscript’s first-round reports. Each report is listed individually. If an editorial decision has already been registered on a manuscript, the system will hide re-review reports submitted by reviewers. Reports will not be made available to authors until the assigned editor manually un-hides the reports on the Reviewers page or registers a new decision (on the above screenshot, you will note that the editor has not yet unhidden the re-review report). The journal can publish either incrementally (publishing each article as soon as it is ready) or by closing issues (waiting until every article in the issue is ready, and then publishing them all at once). The Publish by Closing Issues setting on the Configuration page is used to manage this feature. Depending on your journal’s schedule, publishing incrementally can provide an alternative to the typical publication push of full issues. The incremental publishing option allows you to publish when articles are ready rather than waiting to compile an entire issue or volume. You are free to close an issue and start a new one each year or at whatever interval works best. And authors and readers usually experience less wait time between acceptance and publication. When a manuscript has been accepted for publication it needs to be placed in an issue, and an update will need to be made to the site to make the manuscript accessible to readers. Click Publish in the left-hand sidebar. Select a location from the list of available issues and click Continue. The manuscript will be assigned the next sequential article number by default. Once published, the article number cannot be changed, nor can the article be moved to another issue. Click Publish. The site can be updated at the time of publication or at a later time. Published issues and manuscripts will not appear until the site has been updated. 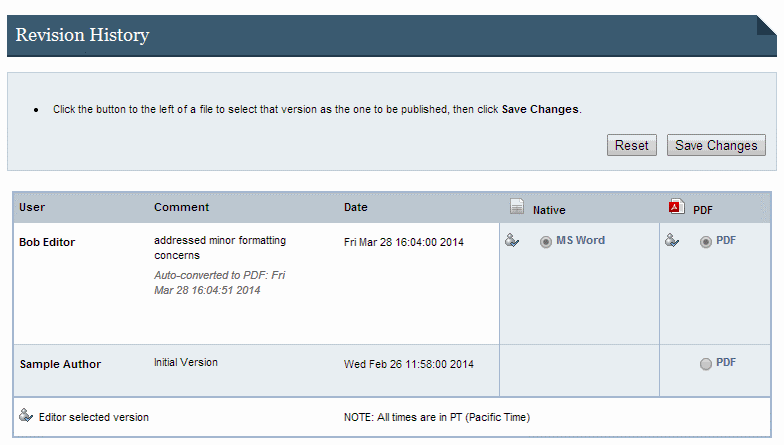 After a manuscript is published, its status will change on the Manage Submissions page to published. Authors will be notified via email when their manuscript is available on the journal’s website. To publish an entire issue at one time, editors will assign manuscripts to that issue and then close the issue. Navigate to the manuscript’s page in Manage Submissions. Click Issue Assignment in the sidebar. Choose an open issue and click Assign. A new Contents page for that issue will appear listing the contents of that volume and issue in the order that they will appear. The page also lists the manuscript number and first author of all unpublished manuscripts that have not been assigned to an issue yet. To add additional manuscripts to the issue, select them, and click the Add button. To re-order documents, change the number in the Order column. Remove manuscripts from the issue by selecting the checkbox in the Remove column and clicking Submit changes. Go to the Manage Submissions page and click View/close issue. Select the radio button next to the issue and click Continue. Manuscripts will display in the order selected, unless they are sorted by document type. These issues will sort by document type, then sub-sort in the order they appear on the View/close issue page. Throughout the publication process use Click here to edit issue to assign accepted manuscripts and to ensure their proper order. When all of the accepted manuscripts have been assigned to the issue and are in the correct order, click Close issue to publish the issue. After closing an issue, published articles can be revised by editors by using the Revise Submission link in the manuscript’s Submission Details page. Once an issue is closed, new items cannot be added and the assigned items cannot be reordered by editors. If an editor closes an issue and needs to re-order the articles or add new ones, please contact Consulting Services (dc-support@bepress.com). After closing the issue, a journal update is required in order to make the issue and its articles available to the public. Before updating the journal, you may preview individual articles by clicking Preview Submission in the left-hand sidebar of the Submission Details page. This will allow you to see how the published manuscript will appear on the journal site. This is a preview only; it does not fully represent the article page once the site is updated. If article details are as expected, click Update ir_journal to make the new article visible, or the new issue visible if publishing by closing issues. When an editor accepts a manuscript, a Request approval link will appear in the submission’s sidebar. When selected, the system generates a request approval email. The editor can leave the email as is or modify it before sending it to the author. The author can preview the final version of the manuscript and either give approval or revise the submission. Once an author gives approval, the manuscript can be published in an open issue. Some editors also request the Publication Checklist feature. After accepting the manuscript, editors will see the new sidebar link Publication Checklist, which requires completion before requesting author approval. Common checklist items include confirmations that metadata, copyediting, typesetting, and copyright agreements are complete. To customize your checklist, contact Consulting Services with your journal’s specific criteria for publication. If new revisions are received after completing the checklist and gaining author approval, the steps will need to be repeated. This is to ensure both the quality of the publication and consistency in the journal workflow. This section includes settings to control the appearance and workflow of the journal. After modifying the options below, use the Submit Changes button to save your modification. Note: Options that affect appearance or visibility will require an update for the changes to become visible to the public. The Preview ir_journal and Update ir_journal links in the left-hand sidebar allow you to confirm your changes are correct and then make your changes live. Introductory text: A text box for including cover text on the journal’s home page. Show latest Special Issue link in sidebar: If checked, and the issue-level configuration Is this a special issue? is checked, then the title of the special issue will appear in the journal’s sidebar. Suppress Most Popular Papers link in sidebar: If checked, the corresponding link will disappear from the journal’s sidebar. Hide this journal on the repository: If the journal intends to stay hidden (while uploading initial articles, adjusting site text, etc. ), checking this box will prevent updates to the journal and keep it from appearing on repository pages. Hide link to submit form: If checked, the link allowing author submissions to the journal will disappear from the journal’s sidebar. Maximum number of reviewers per article: If included, the system will prompt editors to solicit the number of reviews indicated. Editors may override this selection using the options provided on the Reviewers page of any submission. Number of days to submit a review: If completed, the system will prompt reviewers to complete their reviews in the number of days indicated. Editors may override this selection using the options provided on the Reviewers page of any submission. Author approval required: If checked, authors must give approval prior to publication. Publish by closing issues: If checked, the journal will change from the default setting of publishing incrementally to requiring an editor to close each issue for publication to occur. Using these text fields, editors can customize the journal’s About, Aims and Scope, Editorial Board, and Policies pages, as well as the Final Manuscript Preparation Guidelines page. Standard HTML text formatting is accepted, including bold, italic, and super- and subscripts. The Administrators link in the sidebar of the Configuration tab is used to add or remove editors. For details on adding an editor, or modifying or limiting an editor’s permissions, please refer to the Administrator Permissions guide. To create volumes and issues, you will need to be an editor of the journal. Site-level administrators may add themselves (or others) using the Administrators option available from the journal Configuration page. Enter a number for the new volume. The next available number will appear by default, but you may edit it if needed. This number will be part of the URL for the volume as well as the issues and articles within it. Once published, each article’s URL is permanent. Choose a number for the issue, following the same guidelines as for volumes. To view settings for a particular volume, click the label for that volume at the top of the Configuration screen. Publication date: Optional setting that displays the volume year after the volume title in locations such as the journal homepage and the “All Issues” page. The year will also appear on the PDF cover page. For volumes that span multiple years, it is recommended to use the issue-level date instead and choose the journal-level setting Display issue year instead of volume year. Hide this volume and its contents: Hides links to the volume on the rest of the site, and prevents updates to the volume while this setting is enabled. You may access issue settings by clicking an issue label at the top of the volume Configuration screen. Use issue settings to add an issue title, introductory text, or editor notes. If cover art is enabled for your journal, you can upload cover art, add an editorial board, and add extra issue information. Issue date: Optional setting that displays the issue year after the issue title in locations such as the journal homepage and the “All Issues” page. The year will also appear on the PDF cover page. This is useful for journals with volumes that span more than one year. If entering issue dates, the journal-level setting Display issue year instead of volume year will need to be enabled. Is this a special issue? : Adds a link to the issue in the journal sidebar under a “Special Issues” heading. Hide this issue so that it’s not displayed on the site: Hides links to the issue on the rest of the site, and prevents updates to the issue while this setting is enabled. If you have any questions about your journal’s configurations or publishing tools, please contact Consulting Services at dc-support@bepress.com or weekdays at 510-665-1200, option 2, 8:30 a.m. to 5:30 p.m. Pacific time.